Water plays a fundamental role in sustaining life. We need water for core human needs such as drinking, food preparation and hygiene. The importance of these needs are recognised in the Water Act by establishing the notion of critical human water needs (CHWN). CHWN refers to the minimum amount of water needed to meet basic human needs. It also includes non-human needs, where a failure to meet these needs would cause too much damage to social, economic or national security, for example water for significant local industries or community uses such as firefighting. 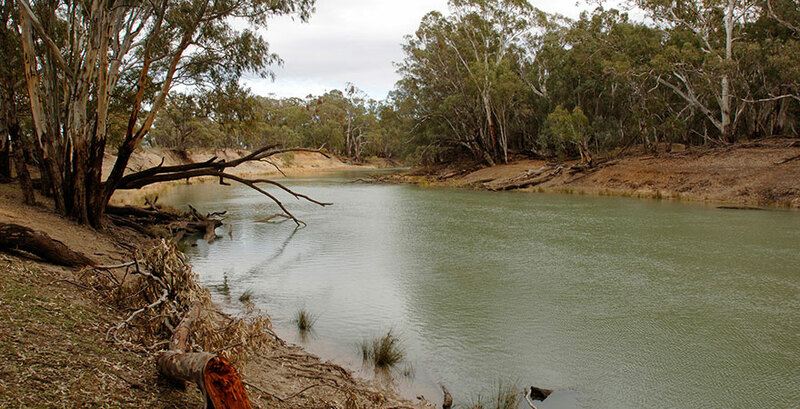 The Basin Plan (chapter 11) and Murray‑Darling Basin Agreement work together to prioritise water for critical human needs in the River Murray System. This is done by setting the volumes required to meet and deliver CHWN and by establishing a tiered approach to water sharing in the River Murray System. The Murrumbidgee River near Hay in New South Wales. The figure below shows how water is prioritised to meet critical human water needs. The highest priority water in the River Murray System is conveyance water, which is the amount of water needed to ensure the CHWN volume gets to where it is needed without it evaporating or seeping into the riverbed. As conditions improve and further water becomes available, CHWN, followed by the conveyance reserve volumes are set aside. The conveyance reserve is an additional amount of water set aside for the next year to minimise the risk of not enough conveyance water being available. New South Wales, Victoria and South Australia are each responsible for setting aside the water they need to meet critical human water needs. They may use water from outside the River Murray System, for example from tributaries, groundwater or desalination. Volumes must be set aside by the start of the water year (1 June to 31 May). Once the required volume of water is set aside to meet and deliver critical human water needs, any further water that enters the system is then made available to state allocations. The Basin Plan also sets out requirements for monitoring, assessment and management of risks with regards to critical human water needs. These requirements complement the MDBA's normal processes for managing risks to water availability in the River Murray System. To help prioritise critical human water needs, the Basin Plan and the Murray–Darling Basin Agreement adopts a tiered approach to water sharing. There are three water sharing tiers (see diagram). The Basin Plan sets triggers for moving between water sharing tiers. These triggers are based on the risks to meeting and/or delivering CHWN. The triggers also consider the quality of water available for CHWN. This approach enables greater flexibility and planning in water management for critical human water needs. Water availability triggers are based on forecasts of the water available to meet conveyance water, conveyance reserve or CHWN requirements. Depending on the time of year and amount of water available, Tier 2 or 3 water sharing arrangements are triggered. Water quality based triggers are activated if water is of a quality that cannot be treated for human consumption, or if salinity is greater than 1,400 EC (μS/cm) upstream of Wellington. Activating the water quality trigger establishes Tier 3 water sharing arrangements. Tier 1 water sharing arrangements are the long standing ‘normal’ arrangements in the Murray–Darling Basin Agreement for sharing water in the River Murray System between the River Murray states. Tier 1 arrangements cover very wet, through to very dry conditions. New South Wales, Victoria and South Australia can all meet their CHWN volumes. Conveyance water can be met for the water year. The conveyance reserve can be met for the next water year. Water quality is suitable for CHWN. Tier 2 arrangements are triggered when critical human water needs volumes can be met, but changes to water sharing arrangements are needed to provide conveyance water and/or the conveyance reserve. Conveyance water needs cannot be met in the current water year. There is not enough water to set aside a conveyance reserve for the next water year.. Tier 3 arrangements are only triggered in extreme and unprecedented circumstances. Tier 3 requires an emergency response to be agreed by the Murray–Darling Basin Ministerial Council. There are circumstances of extreme and unprecedented low levels of water availability in the system. There is an extremely high risk that water will not be available to meet CHWN in the next 12 months. there is not enough conveyance water, after taking into account available remedial actions. Water quality even after being treated is not suitable for critical human water needs. More information about these provisions is detailed in Chapter 11 of the Basin Plan. These provisions are complemented by the Murray‑Darling Basin Agreement. Providing for critical human water needs is an integral part of the MDBA’s management of drought. We have prepared a guideline to help the Basin governments and other key stakeholders to understand the links between the Basin Plan and the Murray‑Darling Basin Agreement in managing water for CHWN. This guideline also outlines their roles and responsibilities when water sharing arrangements change.